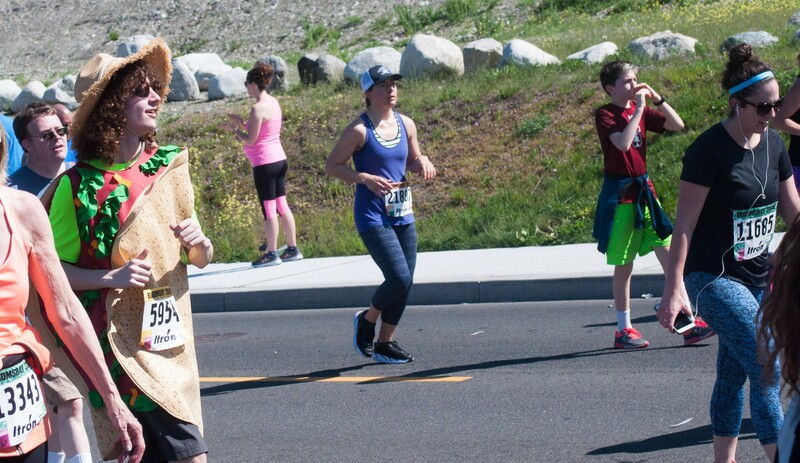 Can you really say you've run Bloomsday if you weren't wearing a crunchy taco outfit the entire time? Every year, there are around 50,000 Bloomsday athletes, from wheelchair racers and international distance superstars all the way down to that guy in a Taco outfit last year. That's 50,000 stories annually. And we want to hear your best ones. We want to find out: What's the craziest thing that ever happened to you on Bloomsday? What's the story you keep telling your friends and family year after year? We're going for a wide variety of Bloomsday stories, of all ages, genders, ability levels and costume choices. A good story should be short, vivid, interesting and surprising. It could be funny. It could be heroic. It could be sad. It could be symbolic. It could be embarrassing or disastrous or gross or romantic — or, ideally, all of the above. Fill out this web-form by April 15 with a quick summary of your story. Don't worry if you can't write very well. If your story is good enough, we'll call you, interview you, and tell your story the way it deserves to be told. Be sure to leave both your email and your phone number, or we most likely won't be able to feature you. If you have any questions, just shoot me an email at danielw@inlander.com.